Bolivian President Evo Morales has threatened “measures” against European countries in response to the grounding of his plane in Vienna last week, demanding they reveal the source of false information that Edward Snowden was on board. “We are expecting European countries that forced me to land to explain what made them think I was transporting the fugitive US citizen. Where did this information come from, and why are they breaking international laws? If we in South America are not given that explanation, we will have to take measures,” the socialist politician said during an interview with RT in La Paz. 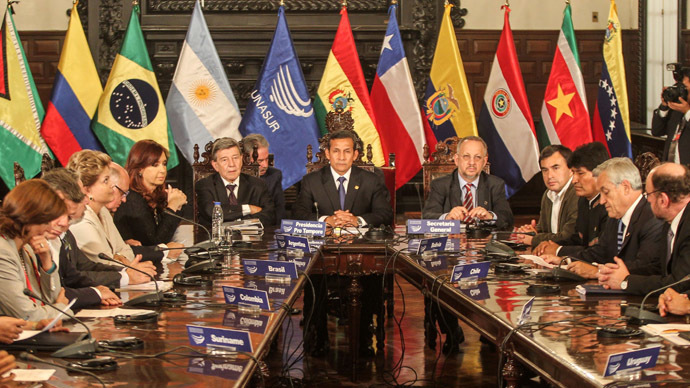 South American states will hold an emergency summit next Friday to discuss the unprecedented diplomatic incident. On Tuesday, Morales’ presidential plane – returning from Moscow – was forced to make a sudden stop in Vienna, after Spain, France, Portugal and Italy abruptly blocked their airspace to him. In Vienna, officials inquired whether the plane was carrying Edward Snowden, the wanted US citizen who leaked details of extensive classified US electronic surveillance programs last month. Morales blamed Washington for masterminding the audacious scheme. “At 3 or 4 pm we are forced to land the plane in Austria. At 6 pm the US ambassador delivers an extradition request in Bolivia, which is proof that is the work of the US, who used European countries for their aims,” said Morales. 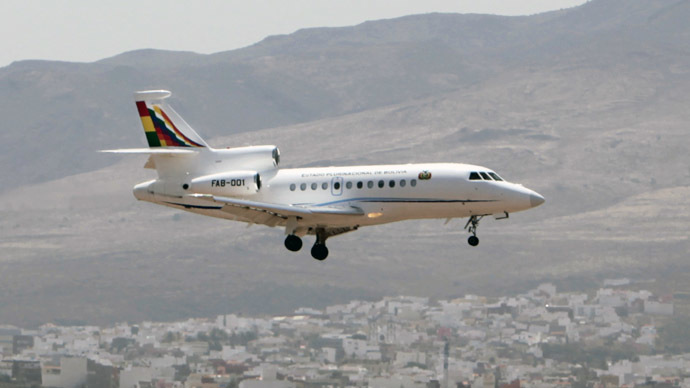 Morales confirmed that officials did not attempt to search the French-made Dassault jet, which would have been “illegal” under diplomatic conventions, but still attempted to find their way on-board. “I said to the airport officials, ‘You can’t search the President’s plane. They said ‘We can’t unless you invite us for a cup of coffee’. They wanted me to invite them for coffee!” recalled a still-seething Morales. Although no side has officially confirmed it, Snowden is widely suspected to still be stranded in Moscow, where he arrived from Hong Kong. In the aftermath of Tuesday’s diversion, Bolivia has offered him asylum (following the example of Nicaragua and Venezuela). The president says he is not mindful of potential counter-measures by the Obama administration. “We have had enough humiliation at the hands of the Americans. 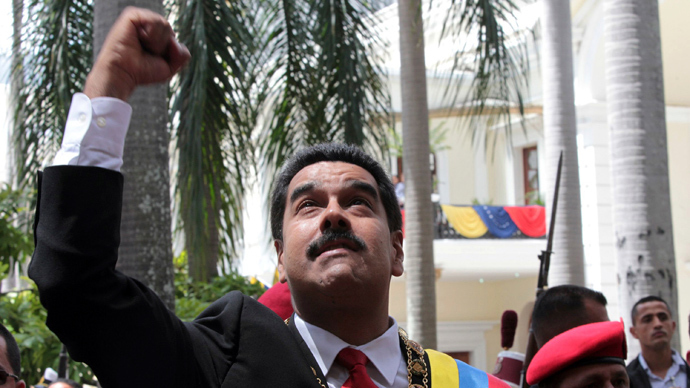 I am not scared of shutting the US embassy in Bolivia,” he said. 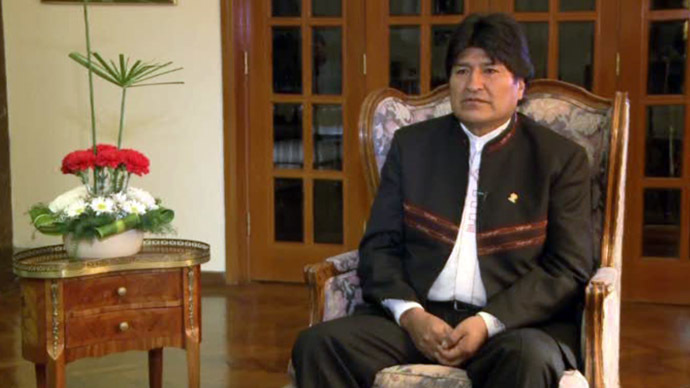 Morales claims the incident reflects a “neo-colonial” attitude to his entire continent. 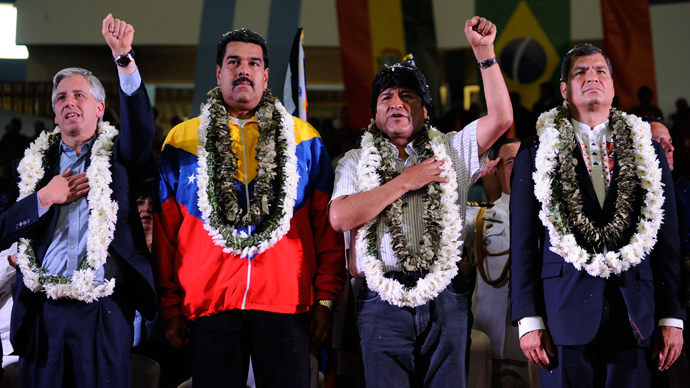 “It is a crime not against Evo Morales, but against the people of South America and the Caribbean. It is utter discrimination,” said Morales, who insisted no one should be treated as a “second-rate president”. Morales also expressed outrage with US economic pressure on those countries that have preliminarily agreed to consider Snowden’s application for asylum. After Ecuador stated it may welcome the fugitive, US said it would revoke preferential trade agreements with the country. “They think that by blackmailing us they think we will change our policies, but we will not,” said the president, who believes the US considers him an enemy because he is “a Native American and an anti-imperialist”. 53-year-old Morales, who has led his country since 2005, says relations between Europe and South America could still be salvaged, but claims there is little chance of the same happening with Washington.